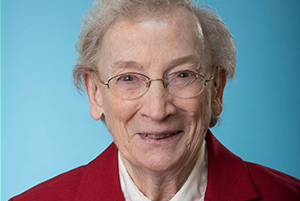 Sister Marianne Therese Boehm, S.C. Sister Marianne Therese Boehm, S.C., a Sister of Charity-Halifax, Nova Scotia, for 68 years, died Oct. 21 at Mount St. Vincent in Wellesley Hills, Mass. She was 89. She was an eighth-grade teacher at St. Paul School, Cobble Hill, 1964-65, and St. Nicholas of Tolentine, Jamaica, 1965-73. She lived in Bellerose and St. Sylvester Convent, East New York, while ministering as a hospital chaplain at St. Clare Hospital, Manhattan, and as a spiritual director. She also ministered in the Rockville Centre Diocese at St. Aidan School, Williston Park, and the House of Prayer in Wantagh, L.I., as well as in New Jersey, Maryland and Massachusetts. She retired to Mount St. Vincent, Wellesley, Mass., in 2005. She is survived by her brother, John. A Mass of Christian Burial was Oct. 25 in the Mount St. Vincent Chapel. Burial was in St. Mary’s Cemetery, Needham, Mass.